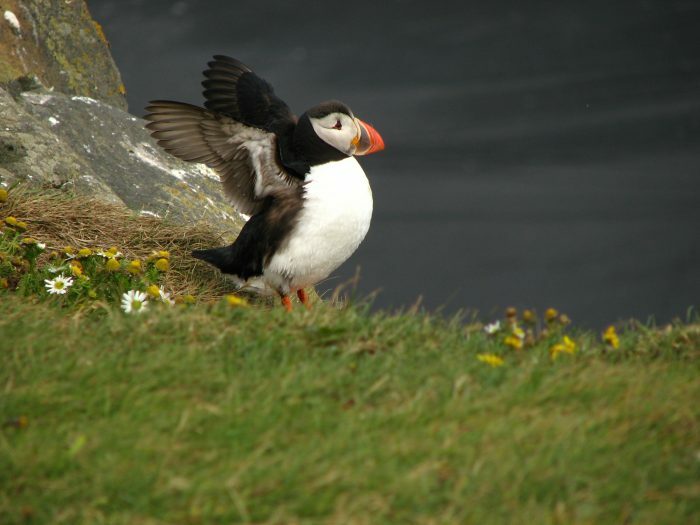 The first puffins arrived in the Westman Islands yesterday as far as vigilant birdwatchers can tell. The birds are gathering at their breeding grounds and late last night a considerable number of them had already landed. The beloved puffin is no less harbinger of spring for the people of Westman Islands than the golden plover to the rest of the country. Puffins are small black seabirds distinguished by a brightly coloured beak during the breeding season. In Iceland they are said to be the gentlest of birds, lovingly known as the provost or the priest, for their black and white suit and vibrant beak. They are pelagic seabirds that feed primarily by diving in the water. They breed in colonies on coastal cliffs or offshore islands, nesting in burrows in the soil, returning each year to the same colonies, cleaning out their burrows maintaining the colonies before breading. The puffin breading of the cost of Iceland is the Atlantic puffin is found in the North Atlantic Ocean.